Enjoy open landscape waterfront living in this affordable move-in ready retreat. 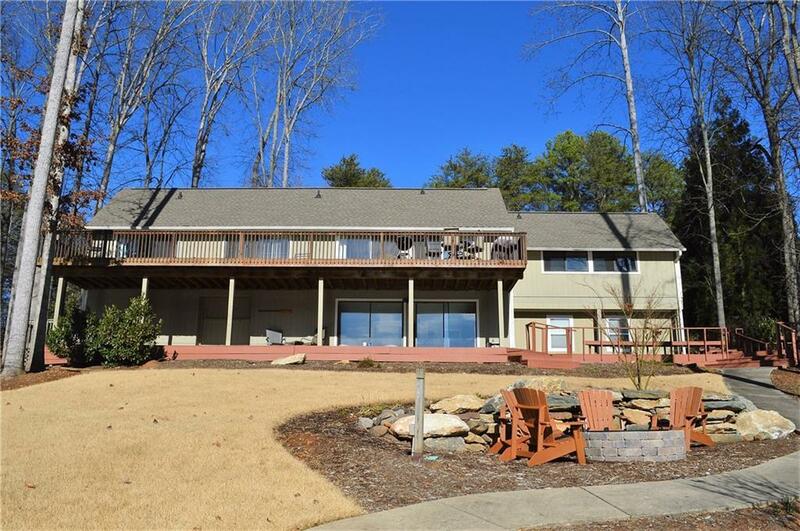 This home features a spacious, open floor plan with waterfront views from itâs entire lakeside. Nestled in a mature established setting, highlights include a gentle sloping lot, concrete walkway to the protected shoreline, covered dock with beach and a stone seating area with fire pit. A home you will remember for those great lakeside BBQâs and waterfront entertaining with deep water at the dock for year-round boating of any kind. Sliding glass makes this bungalow feel much larger than itâs size. There are multiple patio doors leading to the natural landscape with a porch that extends the entire lakeside on both levels. Great outdoor decks and patio used for your choice of additional living, dining or the family's every day relaxing space. The main floor features hardwood floors throughout and, the highlight of successful family gatherings, an open combination of a living and dining anchored by a lake view kitchen. The main level offers three bedrooms with two full baths. On the terrace level, find a large recreation space with tile floors and a 270sqft bunkroom that opts as a generously sized fourth bedroom and third full bath off the lakefront. Additional storage can be found on the side for rafts, skis or lake toys. The open landscape of this yard cannot be reproduced in today's build. *Note Investors: Short term and vacation rentals are permitted in this area and this home has an established rental history. No homeowners fees. * Conveniently near South Cove County Park where you will find a boat launch, fishing pier, sandy beach for swimming and multiple picnic spots. Located less than three miles to shopping, restaurants and medical. Ten minutes to Clemson University. Comfortable enough to make a special home away from home, a value unique enough to make your very own.